On Monday, Kildee accompanied Hekmati’s family to a reunion in Germany, where Hekmati was taken after his release. Pictured (left to right) are Dr. Ramy Kurdi, (Amir’s brother-in-law), Sarah Hekmati (Amir’s sister), Congressman Dan Kildee, Amir Hekmati, and Leila Hekmati (Amir’s sister). FLINT TWP. — After four and a half years in an Iranian prison, Amir Hekmati, formerly of Flint Township, was one of four Americans released in a prisoner exchange last week. 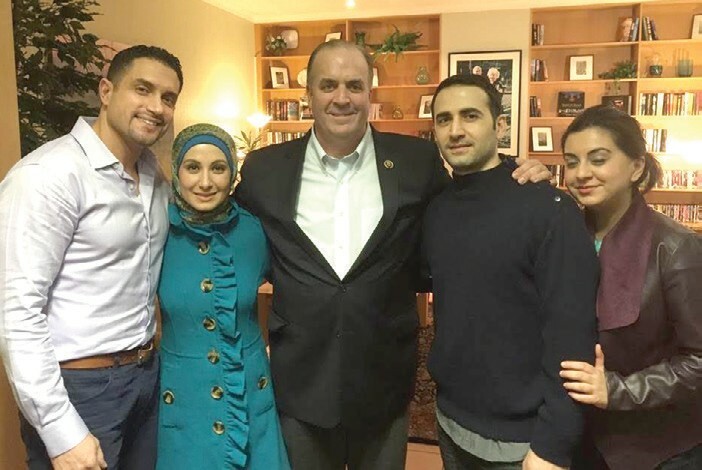 Michigan Congressman Dan Kildee represents the Hekmati family in Congress and has fought tirelessly for Amir’s release. Kildee also expressed gratitude to U.S. President Barack Obama, Secretary of State John Kerry and the entire Administration for never giving up on Amir and the other Americans that were held in Iran. “Their tireless work should be commended,” he said. On Monday, Kildee traveled with members of the Hekmati family to Germany to reunite with Amir Hekmati and bring him home. There’s been no word yet on when that will be. Hekmati’s parents, Ali and Behnaz Hekmati, of Flushing, formerly of Flint Township, eagerly await his homecoming. His father Ali Hekmati, a retired Mott Community College biology professor, is terminally ill and said to be unable to travel. The Hekmati family has vigorously advocated for Amir Hekmati’s release since learning in August 2011 that he had been accused of being a spy for the CIA, imprisoned and sentenced to death. The sentence was later changed to ten years in prison. The Hekmati’s vigorously asserted from the beginning of the ordeal that their son, an ex-Marine, was innocent. He was in Iran visiting relatives before returning to the states to attend college, they said. Congressman Kildee took up the cause of the Hekmati to advocate on a nation- al platform for the release of Amir Hekmati. On Monday, Kildee and members of the Hekmati family were able to spend about 15 minutes with Amir Hekmati at Landstuhl Regional Medical Center in Germany. The Mott Community College (MCC) family also is celebrating Amir Hekmati’s release. MCC has been active in advocating for Amir’s release and supporting the Hekmati family. A benefit dinner to help raise funds for Amir’s legal defense was held on campus April 26, 2012. The keynote address was given by his attorney, Ambassador Pierre-Richard Prosper, U.S. Ambassador-at-Large in charge of the U.S. Department of State’s Office of War Crimes Issues. MCC also hosted a Candlelight Vigil for the Hekmati Family on Sept. 25, 2012. Most recently, the MCC Concert Choir and Chamber Singers presented “Songs of Inspiration, Justice, and Hope” at their annual Spring Concert April 27, 2015 featuring a performance of “I Will Fly (Amir’s Song),” which was written by Dr. Matthew Packer, Music instructor, to stand in solidarity with Amir and his family.